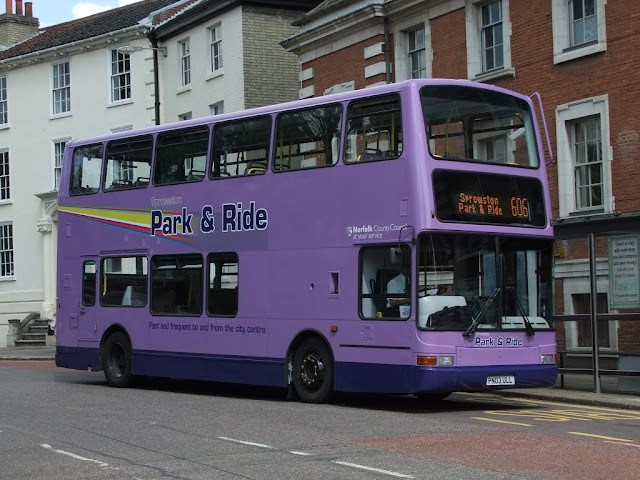 Over the last couple of weeks or so the town's service 8, between Caister's Marram Drive and the James Paget Hospital, has seen the use of yellow and pink liveried deckers, This afternoon a purple one was to be seen on the route! A couple of vehicle swaps have taken place this week which has seen Lowestoft based Enviro 200 45118 ST09JPT go on loan to Ipswich Depot as cover for their Enviro fleet whilst Ipswich Volvo B7RLE 66850 MX05CHD moves in the opposite direction to the Suffolk Coast. 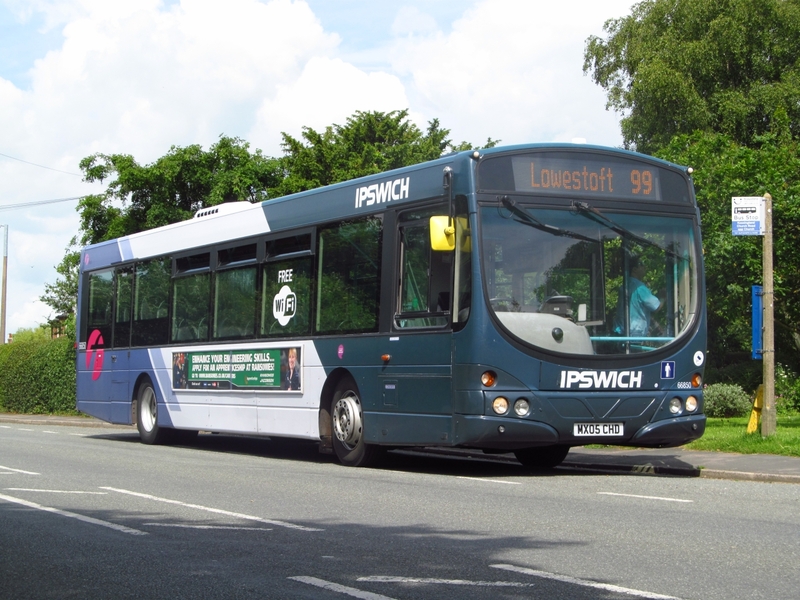 66850 Pictured in Kessingland working the 99 to Lowestoft on Tuesday morning. Yesterday the Sanders family regrettably announced the death of the founder of Sanders Coaches, Norman Sanders, after a short illness. 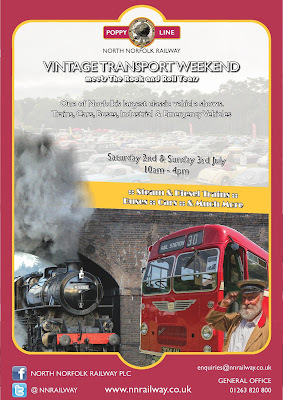 Norman was born in Woodford, Essex in 1930 and worked as a steam fitter for British Rail for many years. After the change to diesel in the early 1960’s he was retrained, but found the fumes caused him illness, The family doctor suggested a new start and in 1968 the family moved to Sheringham in North Norfolk where they had enjoyed many holidays. Norman first worked at Kingsland engineering but hated the indoor factory life so took a job with Mascot Coaches at Cromer as a mechanic where he first learnt to drive a coach. Mascot was taken over by Reynolds Coaches and in summer 1975 Norman left Reynolds to join the 5 coach business of Bennett’s coaches at Holt. George Bennett unexpectedly told Norman in October of the same year he was going to retire and Norman was worried about his job and income. Having discussed with George what might happen, George again unexpectedly said 'Look Norman, you seem to know what your doing why don’t you take it over' Norman who had six children at home and no money said he couldn't afford to and George said 'No worries you can pay me as you go'. On Norman’s 45th birthday, at the end of the day, he was handed the keys of the six vehicles and Sanders Coaches was born the next morning of the 1st December 1975. Little did he envisage that day how the company would expand and grow over the next 25 years. By the year 2000 the company was operating close to 100 vehicles. 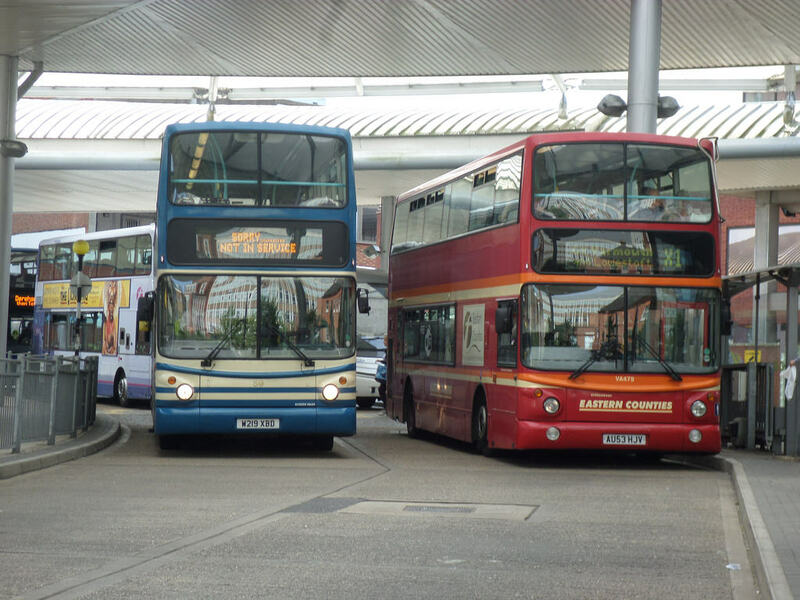 As other companies dropped rural routes a way was found to replace them, Norman was passionate about serving his local community and ensuring peoples transport links remained open. He was often to be found out in his car collecting someone who had mistakenly missed the bus and had an important appointment. 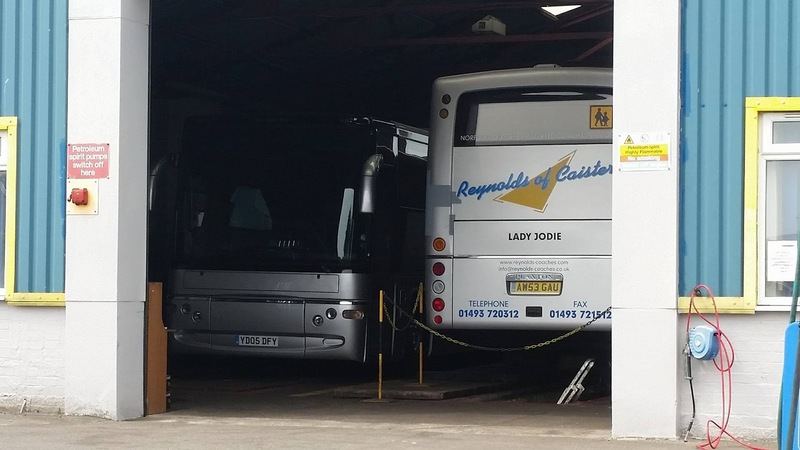 Norman and his wife Gladys spent many years personally escorting many of the 50 plus coach holidays and short breaks they arranged each year. Their personal style and delivery of these holidays was unique and very successful for that reason. Norman hung up his driving gloves on his 80th birthday November 30th 2010 after what can only be described as a job very well done – The Company he built will go on as a living testimony to his life’s work. Oh my goodness what a week has gone by; new operator(s) for the Great Yarmouth - Beccles- Bungay service, an open topper for the Great Yarmouth seafront route (yep,the cat is out of the bag! 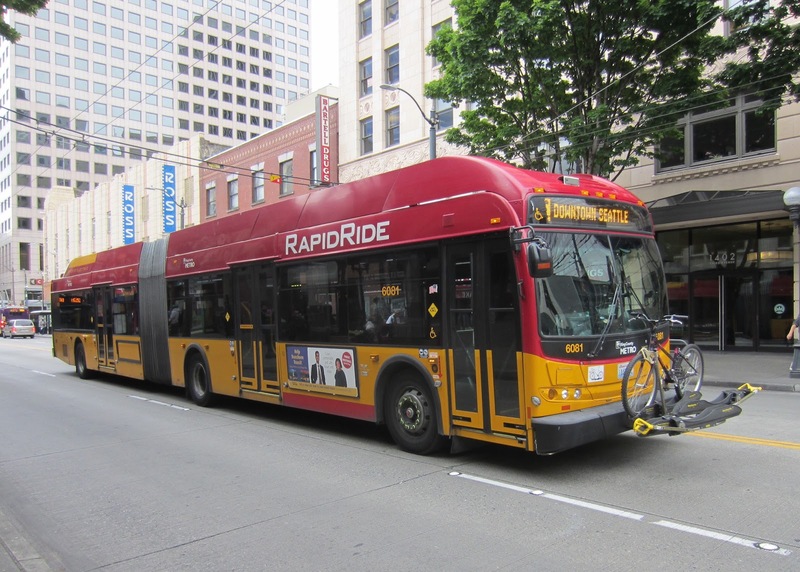 ), streetdecks operating in the town plus new transfers in. (That's without mentioning the Brexit vote). And I've missed it all! It is with great sadness and shock we are reporting the sudden passing of Jim Long. Jim was a regular contibutor to our blog and has been a truly good friend to myself for the past twelve years or so. 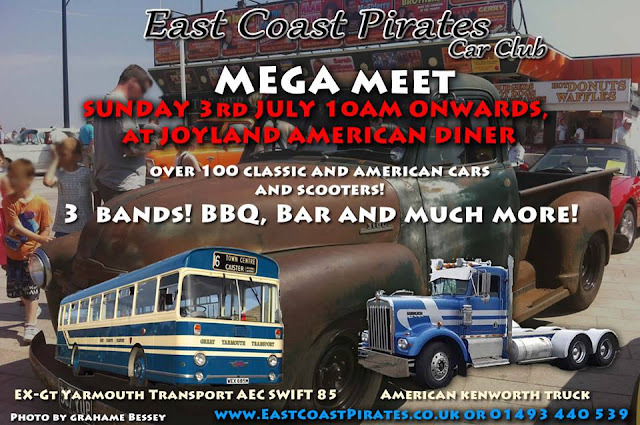 I first came across Jim after he emailed me back in 2004 regarding a photo of mine he had seen in Buses magazine and he asked me if i could send him a copy to which i duly obliged and from that day on we became firm friends and began to share our photographs from our local areas. Jim was Ipswich through and through and his knowledge of all things Eastern Counties and Ipswich Buses was huge going back to the 1950's. His collection of photos was massive, i am lucky enough to have copies of many of his Black & White images he has taken and collected over the years and he was always grateful to me for sharing all my photos from trips around our area. 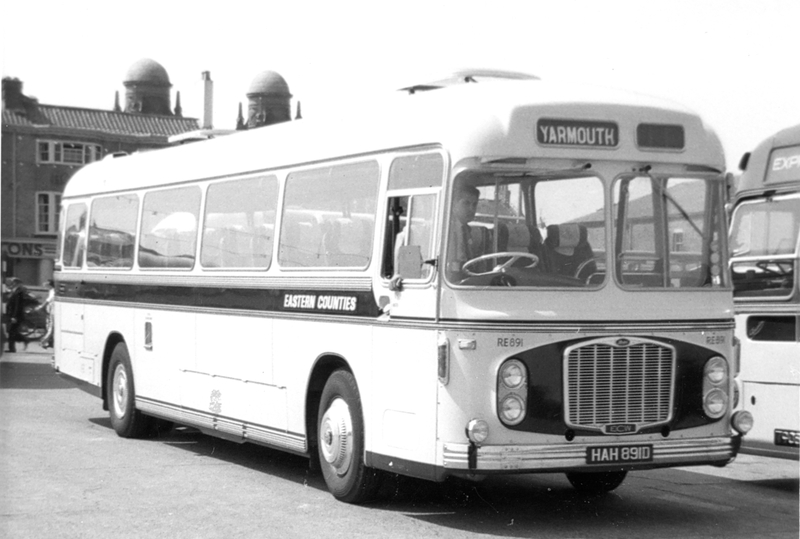 ECOC Bristol RE HAH891D taken by Jim on Yarmouth Sea Front in July 1966. Myself and Roy would like to thank Jim for his contibutions and being part of our Blog Family, they will be truly missed. Our Thoughts, Prayers and Love are with Jim's wife Eve and his family. 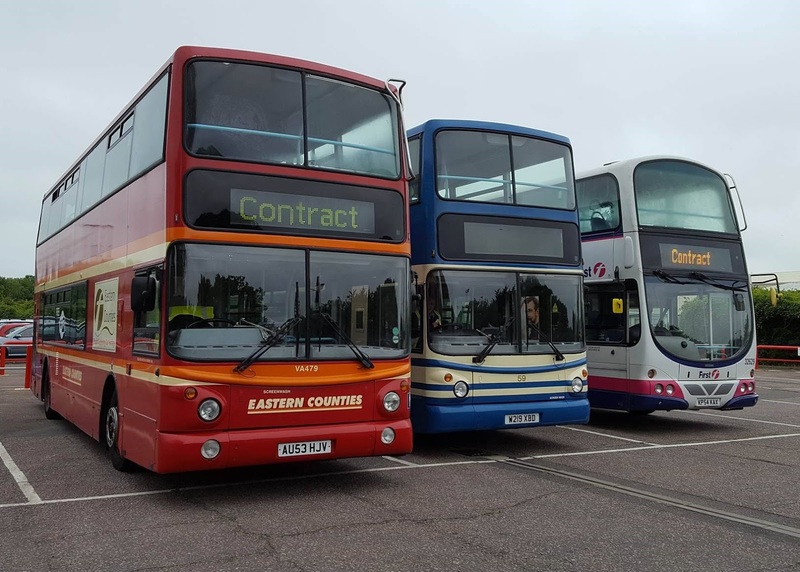 A busy start to the week for First Eastern Counties. We begin with news that a batch of Volvo B9TL/Wright Geminis are being transferred to East Anglia from First Leeds. 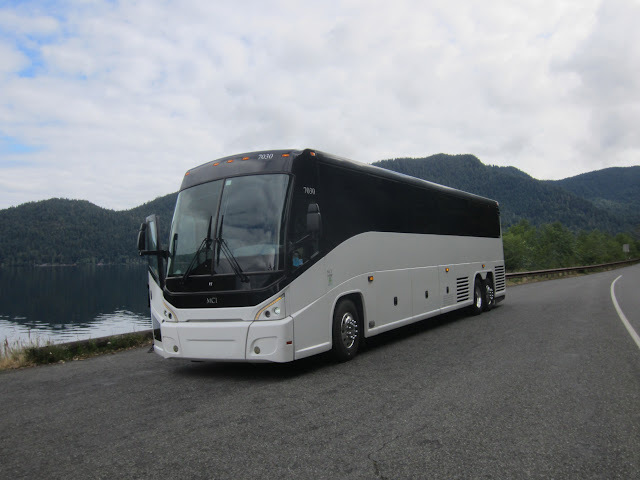 The full list of arrivals due is 36181 - 36202. 36181 (BF12KXU) & 36185 (BN12JYM) were collected today and have now arrived in Norfolk. 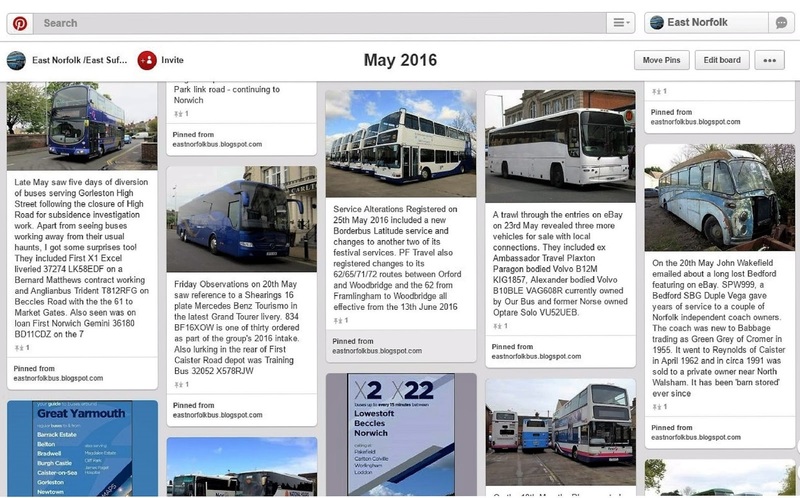 The vehicles were purchased new in 2012 for First Games Transport operations for the London Olympics prior to heading North to Leeds. 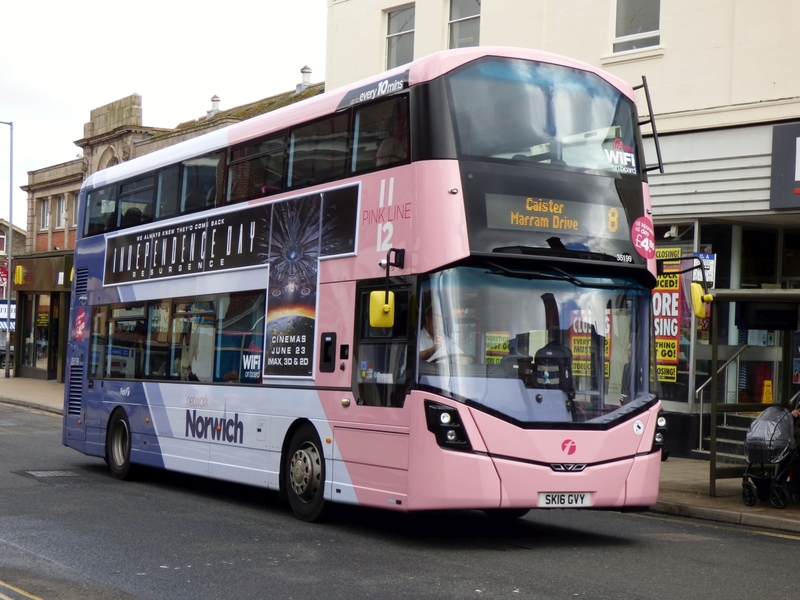 Next to report was another brightly coloured day for the Yarmouth 8 service, last week it saw Yellow, today it went pink with not one but two Norwich Pink Line branded Streetdecks on the route, 35198 (SK16GVX) & 35199 (SK16GVY) Both worked this afternoon in the town. 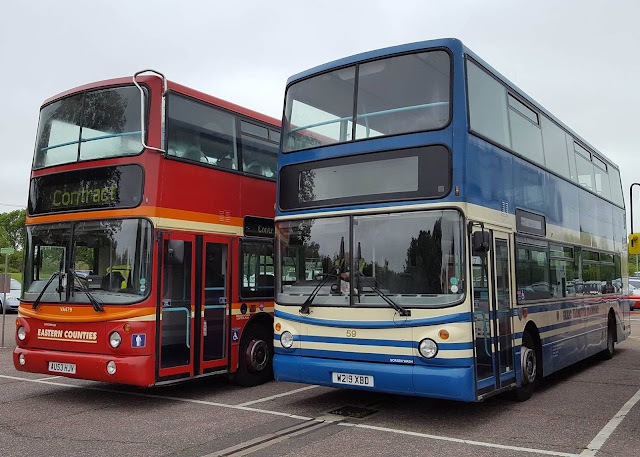 Finally continuing the multi coloured theme our regular Ipswich contributor Jim Long has been down to the paintshops of Simon Morris in Ipswich to catch up with the progress of the first Blue Line repaint for Norwich. 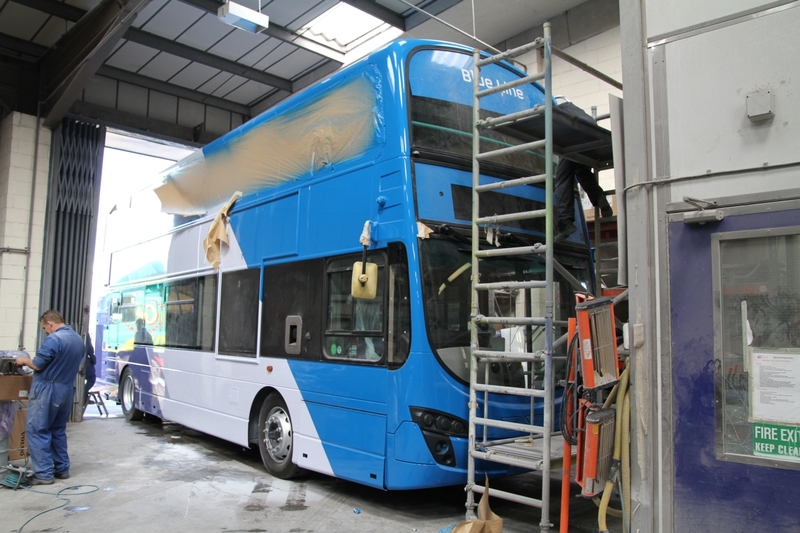 Volvo B9TL 36166 is currently being transformed into its new look in Suffolk. 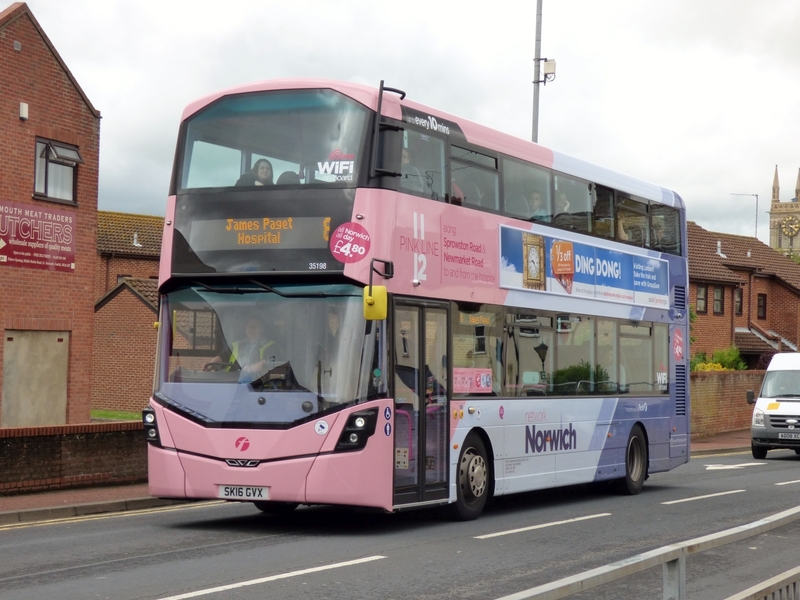 Many Thanks to Chris Speed, Danny Beales, Zak at Norwich Bus Page and Jim Long for the Info and use of Photos, much appriciated! During the 1920s and 1930s the Stoughton Cab & Bus Company of Stoughton, Wisconsin designed and manufactured buses exclusively for Chevrolet. 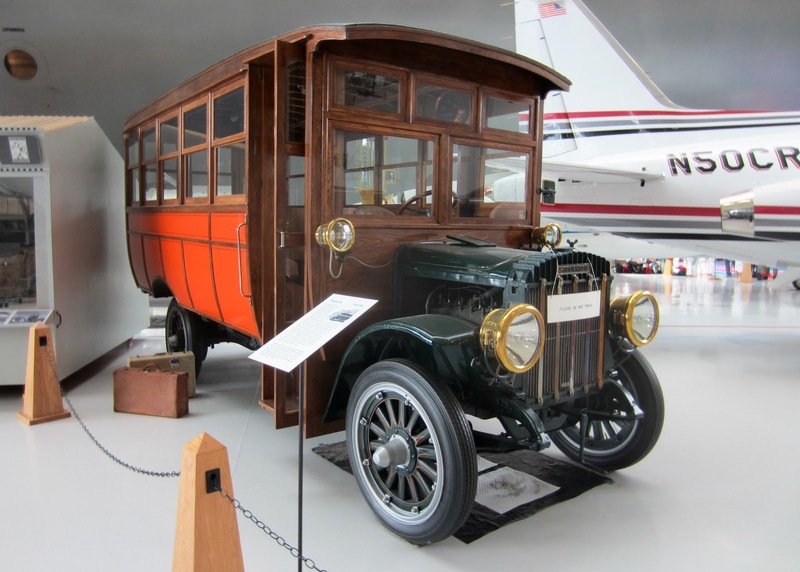 The bus, thought to provide a new influence on the progress of transportation, was powered by a Waukesha four cylinder engine and was capable of an amazing top speed of 30 miles per hour! 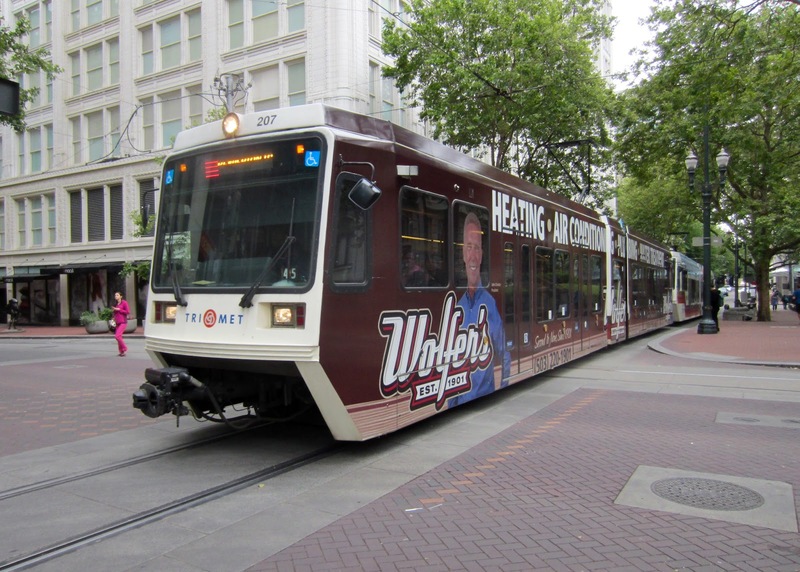 Badger Bus Line, the first company to operate a passenger service between Madison and Milwaukee in Wisconsin, used the Stoughton Bus for its services. The coach bus also saw service with country clubs, hotels, schools and also in connection with railroad and aviation travel. 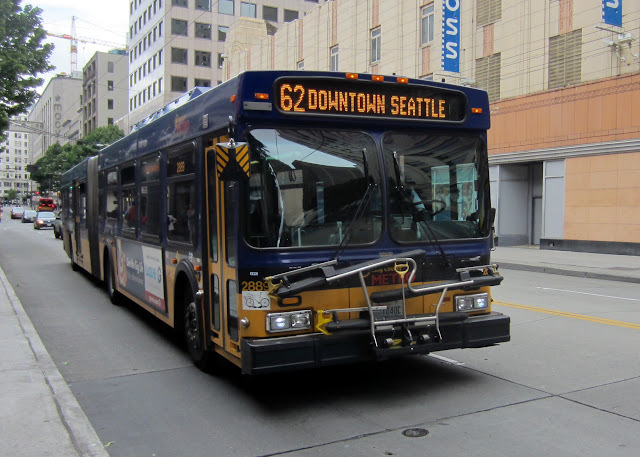 Once again the blog is on tour with a trip across the pond to the USA - yes you did read that correctly as I am reporting from Seattle on the west coast! 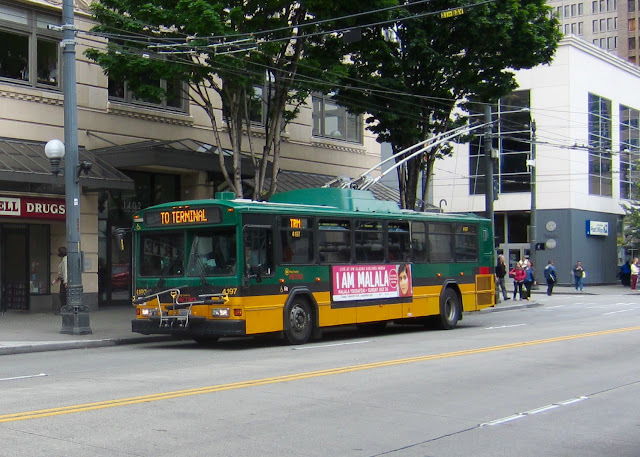 As normal for us Brits, the weather is first mentioned in any conversation and all I can say about Seattle weather today is that it reminds me very much of a typically cold summer's day with a bracing cool breeze. 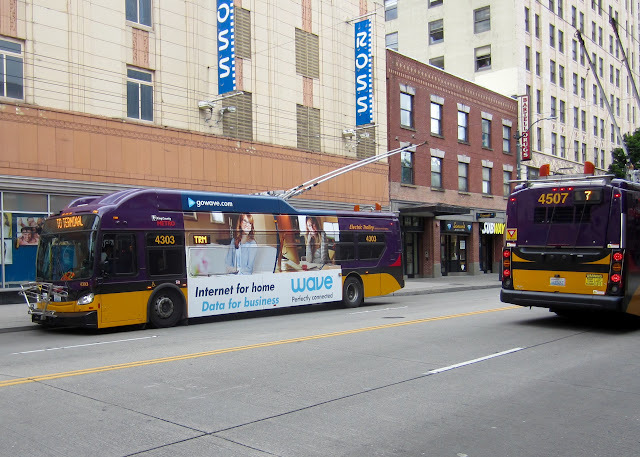 So I really feel at home! An unusual sight this afternoon on the 8 service in Great Yarmouth was Norwich based Trident 32106 (LT02ZCV), it wears the Yellow Line livery for Norwich Network services so was quite noticable in the town. 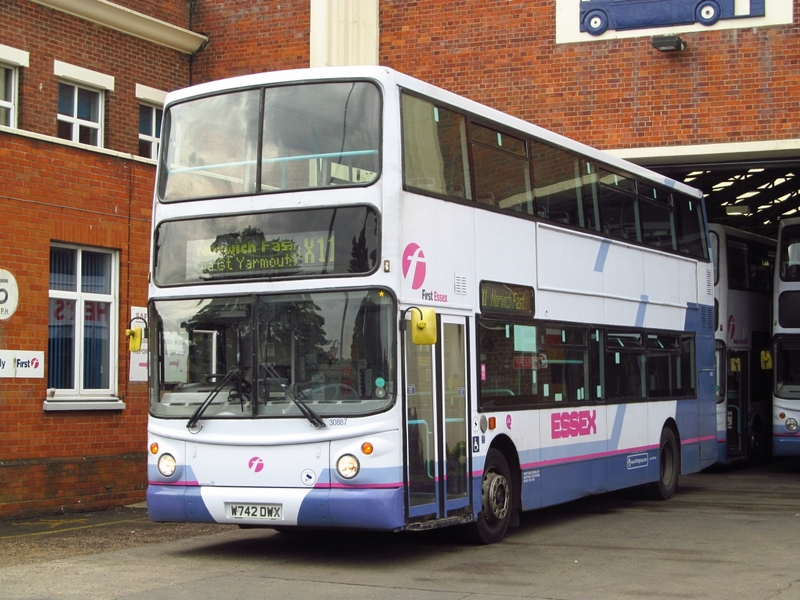 It had just passed its MOT at Caister Road and was pressed into use due to a vehicle shortage. 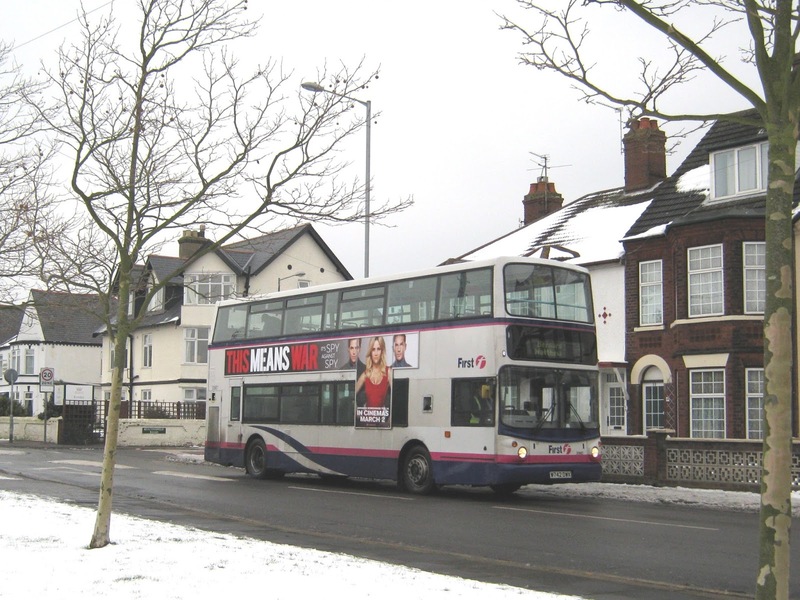 32106 pictured on Barnard Avenue heading towards Caister. Another recent arrival from Norwich was also noted in use on the 1's today, I managed to Photograph Gemini 36180 in my home village of Ormesby this evening as it headed through to Yarmouth. 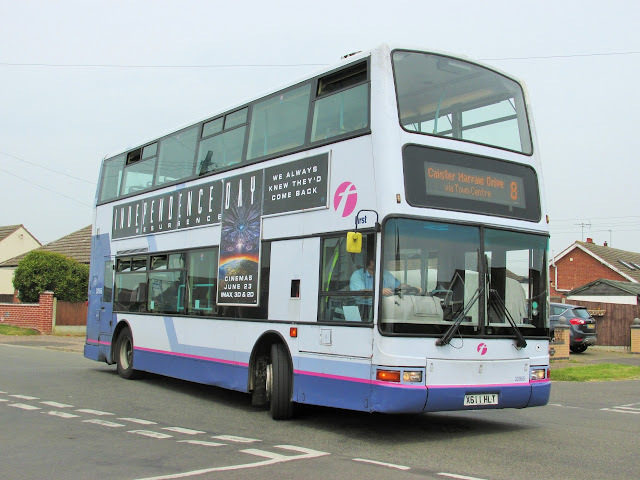 36180 BD11CDZ turns out of West Road in Ormesby. 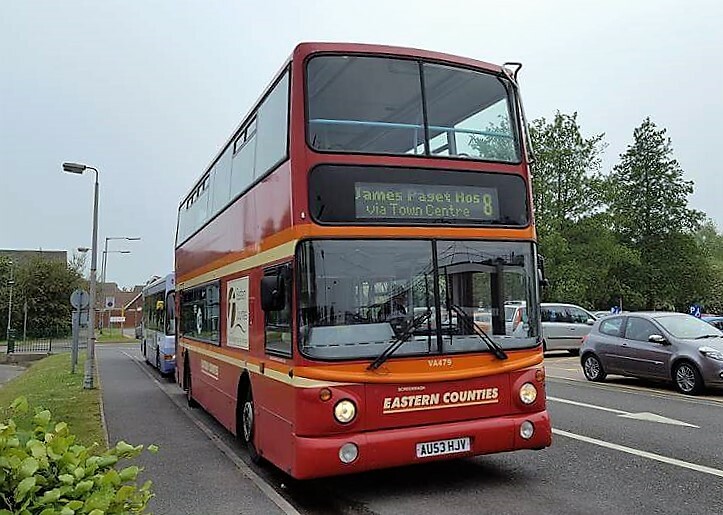 Latest news from Caister Road sees recent arrival from Essex 30887 moving to Lowestoft this evening on a permanent basis after a very brief spell back in Great Yarmouth. 30887 W742DWX awaiting transfer to Lowestoft this afternoon. Norwich based Volvo B9's 36172 & 36180 will move to Caister Road for the summer period, 36180 was at the depot on my visit this afternoon with 36172 which has been on loan at Lowestoft coming in return for 30887 later this evening. Ex First South Yorkshire Trident 32955 (X611HLT) is now in service also here. 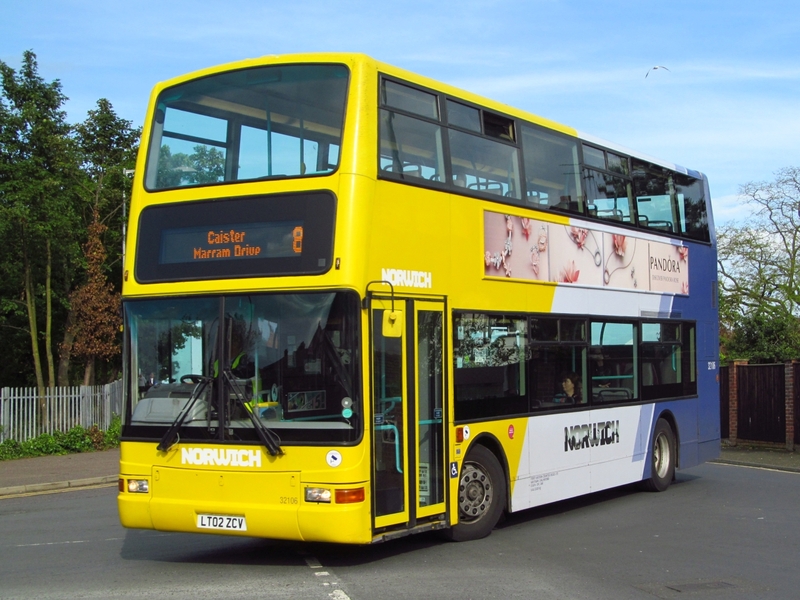 Volvo B7 32348 Suffered a blown Turbo whilst on X1 duties this afternoon at Norwich Bus Station, she was recovered back to Caister Road. 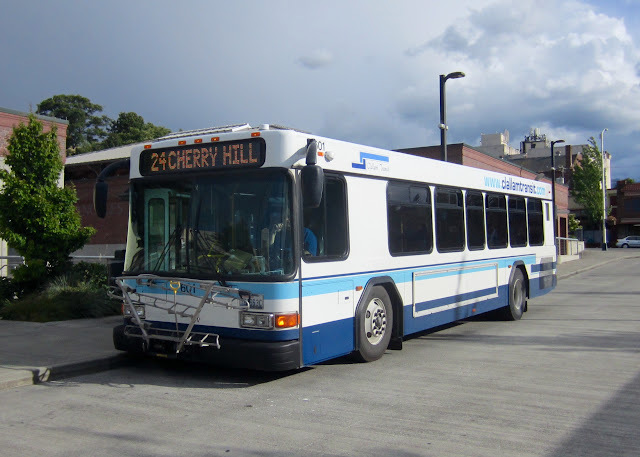 Thanks to Danny Beales for the info and Cameron for the photo of 32955. 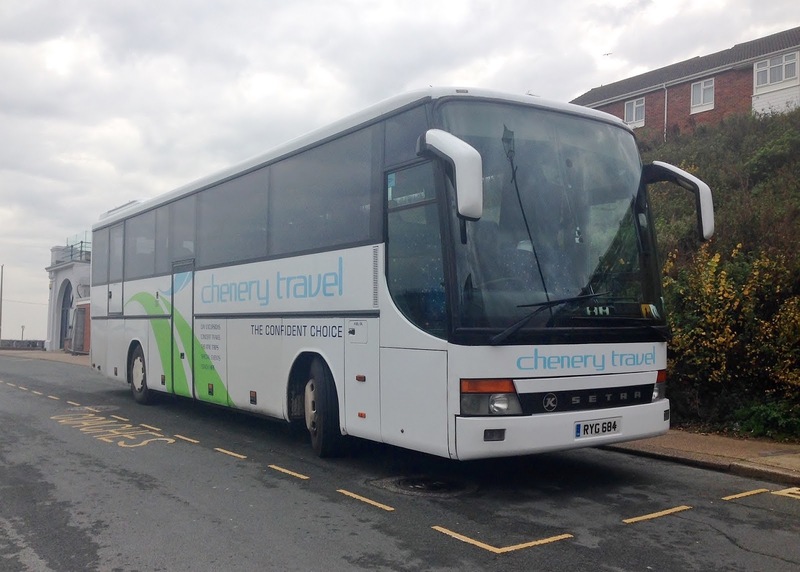 A new arrival to report for the Caister On Sea operator is Dennis Javelin/Plaxton bodied YD05DFY. It was new to VT Aerospace, Lonton on Ouse. It has been repainted into the Silver fleet livery and is awaiting the lettering and name to be applied. Many thanks to Cameron for the photo. Buckland Omnibus Company of Hatcheson, Woodbridge is to provide a Wednesday, Sunday and Bank Holiday service from Fort Green, Aldeburgh to Dolphin Public House, Thorpeness. Known as service 250 it commences on 27th July 2016. Acle based Our Hire is to introduce a seasonal service from Vauxhall Holiday Park to Seashore Holiday Park in Great Yarmouth, via Market Gates and Britannia Pier, from 21st July 2016. 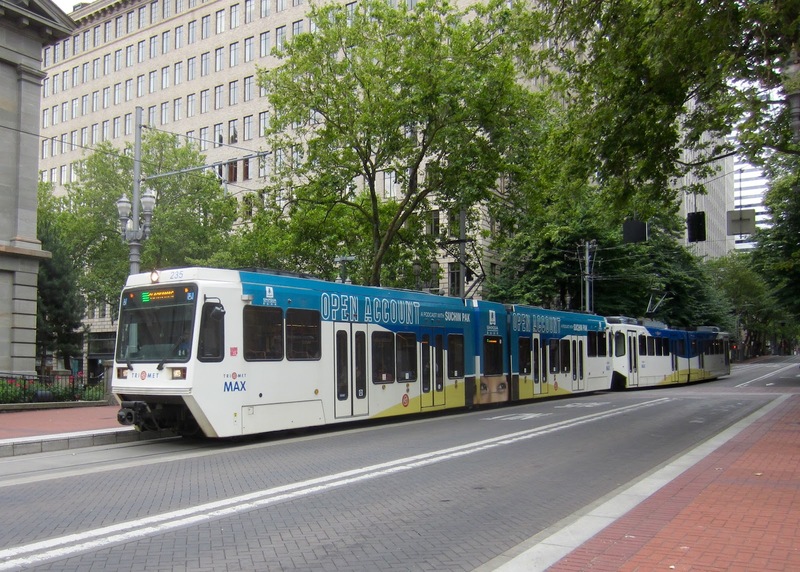 The 300 will run half hourly Monday to Friday and hourly at the weekend. 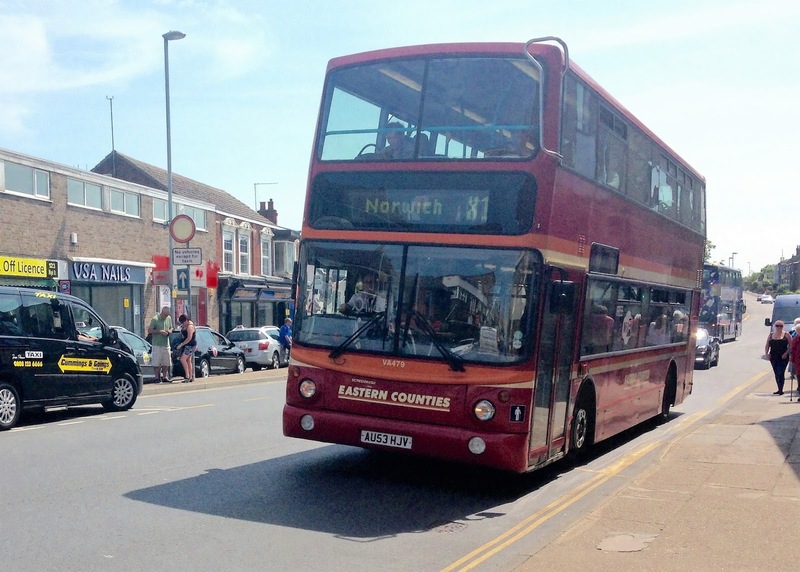 Anglianbus is cancelling its service 90 between Lowestoft and Southwold from 24th July 2016. 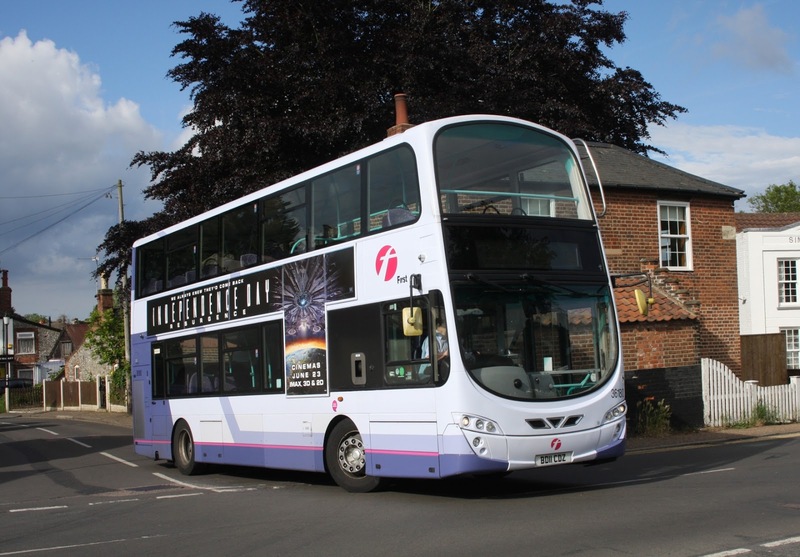 The Suffolk operator hopes to commence using the 11.1 metre orange demonstrator on its services from Saturday with it staying for a fortnight for evaluation purposes. 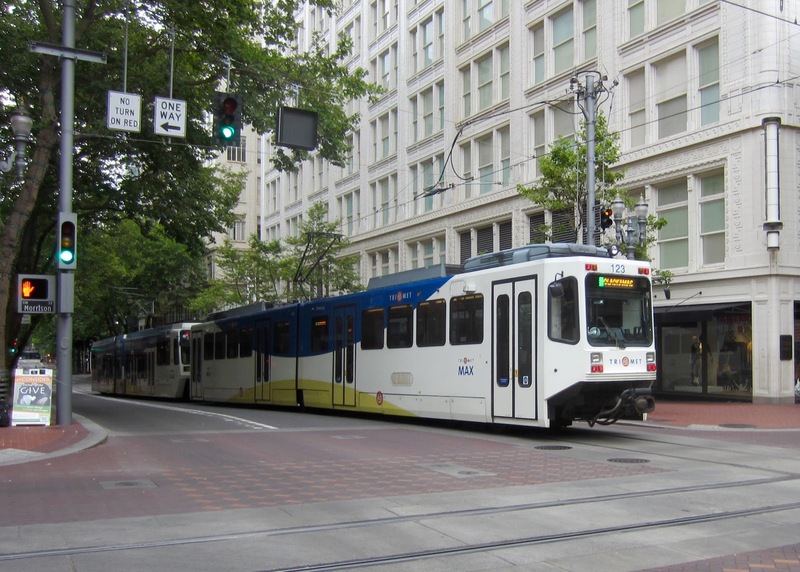 Yesterday saw the start of First's new weekday Summer timetable; although if you look at the weather you wouldn't have believed it! 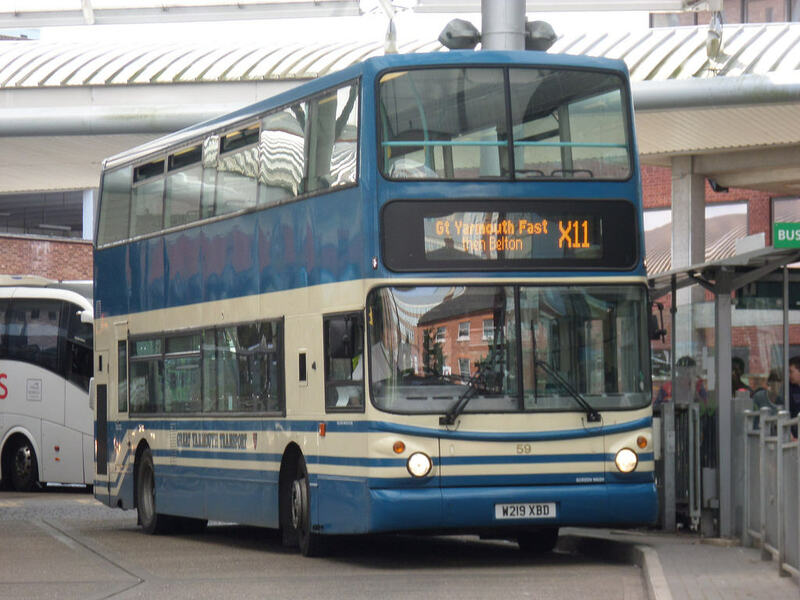 Finally on the transfer front, Gemini 36180 BD11CDZ has returned to Norwich off loan to be replaced by similar 36173 BD11CFX at Caister Road. Also here is Transbus ALX400 heritage liveried 32479 AU53HJV from across the border at Ipswich.